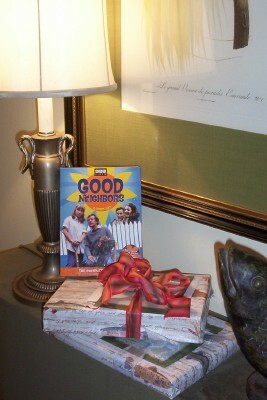 Like Merchant Ships: Good Neighbors Giveaway! To celebrate my upcoming last-trip-to-the-post-office-before-I-have-this-baby, I'd like to give something away. Would anyone be interested in watching the DVD series 1-3 of the BBC hit Good Neighbors? This '70s era comedy follows a couple who leave the rat race for their chance at self-sufficiency. They dig up their lawn for vegetables, install livestock in the back yard, scavenge, barter, and learn to live without money. Their best friends and neighbors watch in horror as the Goods live off the land in the suburbs. The campy humor has kept me giggling many a sleepless night this spring. Now I'd like to pass it along to someone else who'll appreciate it! If you'd be interesting in having this DVD set, please email likemerchantships@yahoo.com --and if you'd be so kind, a quick suggestion for improving Like Merchant Ships or an idea for a future topic. On Friday I will randomly draw the winner's name from the basket and ship it to your home. American or APO address entries only, please. Your "E-mail me" link is not working! Put me in the drawing! I'd love to see it. I sent you an email. I love a contest. Speaking of last trips to the post office,you haven't said much about the baby lately. Are you getting nervous/excited? Whenever I am pregnant, I look at my approaching due date with a mixture of both excitement and dread! Is everything shipshape and ready to go in the nursery? I would love to see some photos of your nursery, etc, if you feel comfortable sharing them. Everything in your house always looks so lovely, and I always feel inspired from the beautiful things you are doing at home! I have this set! I thought I was the only one! So I guess I'll skip the contest:( But I do have one thing I'd love for you to write about - if y'all homeschool, how do you save money there? Oh, we love that show. Over here in England, we call it The Good Life. Sigh. It's actually illegal to keep even chickens in many, many areas let alone pigs and goats. Many years ago my husband and I lived in England, we love the show. It still shows from time to time here in NH and each time I watch it. What a great show. I suppose I'm too late to receive the set, but will offer another fun watch (from our library) PBS' The 1940s House, where an English family spends 6 weeks creating life during WWII. It is fabulous!